The tutorial shows how to use the LEFT function in Excel to get a substring from the beginning of the text string, extract text before a certain character, force a Left formula to return a number, and more. Among many different functions that Microsoft Excel provides for manipulating text data, LEFT is one of the most widely used. As its name suggests, the function allows you to extract a certain number of characters starting at the left side of a text string. However, Excel LEFT is capable of much more than its pure essence. In this tutorial, you will find a couple of basic Left formulas to understand the syntax, and then I will show you a few ways in which you can take the Excel LEFT function well beyond its basic usage. 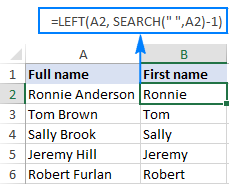 The LEFT function in Excel returns the specified number of characters (substring) from the start of a string. Text (required) is the text string from which you want to extract a substring. Usually it is supplied as a reference to the cell containing the text. Num_chars (optional) - the number of characters to extract, starting on the left side of the string. If num_chars is omitted, it defaults to 1, meaning that a Left formula will return 1 character. If num_chars is greater than the total length of text, a Left formula will return all of text. Important note! LEFT belongs to the category of Text functions, therefore the result of a Left formula is always a text string, even if the original value from which you extract characters is a number. If you are working with a numeric dataset and want the LEFT function to return a number, use it in conjunction with the VALUE function as demonstrated in this example. Apart from extracting text from the left of a string, what else can the LEFT function do? 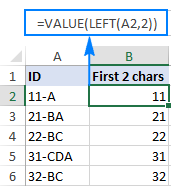 The following examples show how you can use LEFT in combination with other Excel functions to solve more complex tasks. In some cases, you may need to extract the part of the text string that precedes a specific character. For example, you may want to pull the first names from a column of full names or get the country codes from a column of phone numbers. The problem is that each name and each code contains a different number of characters, and therefore you cannot simply supply a predefined number to the num_chars argument of your Left formula like we did in the above example. If the first and last names are separated by a space, the problem boils down to working out the position of the space character in a string, which can be easily done by using either SEARCH or FIND function. The formula works with this logic: the LEN function gets the total number of characters in a string, then you subtract the number of unwanted characters from the total length, and have the LEFT function return the remaining characters. As shown in the screenshot below, the formula successfully cuts off the " - ToDo" postfix (4 letters, a hyphen and 2 spaces) from the text strings in column A. As you already know, the Excel LEFT function always returns text, even when you are pulling a few first digits from a number. What it means to you is that you won't be able to use the results of your Left formulas in calculations or in other Excel functions that operate on numbers. As you can see in the screenshot above, the numbers in column B obtained with a Value Left formula are right-alighted in cells, as opposed to left-aligned text in column A. Since Excel recognizes the output as numbers, you are free to sum and average those values, find the min and max value, and perform any other calculations. These are just a few of many possible uses of LEFT in Excel. To have a closer look at the formulas discussed in this tutorial, you are welcome to download the Excel LEFT function sample worksheet. If the Excel LEFT function does not work properly in your worksheets, it's most likely because of one of the following reasons. Most often, the VALUE error occurs when the num_chars argument is represented by another function. In this case, copy that function to another cell or select it in the formula bar and press F9 to see what it equates to. If the value is less than 0, then check the function for errors. To get rid of the leading spaces in your worksheets, use the Excel TRIM function or the Text Toolkit add-in. If you attempt use the Excel LEFT function to get an individual part of a date (such as day, month or year), in most cases you will only retrieve the first few digits of the number that represents that date. The point is that in Microsoft Excel, all dates are stored as integers representing the number of days since January 1, 1900, which is stored as number 1 (for more information, please see Excel date format). What you see in a cell is just a visual representation of the date and its display can easily be changed by applying a different date format. For example, if you have the date 11-Jan-2017 in cell A1 and you try to extract the day by using the formula LEFT(A1,2), the result would be 42, which is the first 2 digits of number 42746 that represents January 11, 2017 in the internal Excel system. To extract a specific part of a date, use one of the following functions: DAY, MONTH or YEAR. This is how you use the LEFT function in Excel. I thank you for reading and hope to see you again next week. 18 Responses to "Excel LEFT function with formula examples"
OMG, I love you. I could tell the =Left was text but didn't know what to do about it! it is working fine with records 1,2 and 4 but with 3 it is showing an error. how do i incorporate this? The IFERROR function will return a message such as "No Space" if the formula would otherwise return #ERROR. which would return the value of A5. If you copy this down the column you will see the A5 will change to the relative cell address. Other than this, I guess you'll need to add a space to the record. If I have a list of numbers, all with various amounts of digits (some 2, 3, 4, 5, or 6 digits long) and I want them all to be uniform and add a prefix (like a P in front) so they are all P00000000, what formula would I use? You can use Concatenate function. If I have a list of numbers, all with various amounts of digits (some 2, 3, 4, 5, or 6 digits long) and I want them all uniform in format, with a prefix (example below), what formula would I use? Please use below formula. I'm Assuming the length should be 9, you change it for your requirement. 7, 9, 11, I7, 5, I9, 3, 10, I2. So I want to sum all numbers and the digits after the "I" (7,9,2). These may appear random, no exactly place. I found this formula on the Microsoft site. I think it is what you're looking for. Where the data is in I29:R29 this is entered in an empty cell as an array. This means, in the formula bar enter this formula then with the cursor somewhere in the formula click CTRL Shift Enter together. This action will tell Excel this is an array and you'll see the curly brackets surrounding the formula. When I use the Left formula to remove the last 4 digits of a zip code in a new column and then try to replace the original column with the reduced zip code, I get the #Value code. The original column is listed as Special - Zip Code and it doesn't help to change to numbers. I just want to remove the last 4 digits of the zip code in a column of expanded zip codes! 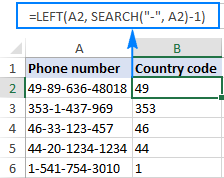 I want to use the left formula to extract the name of country from the first 1-3 in the phone number column. I think you should use a VLOOKUP formula and table with this. Here's an article that should help guide you in using that approach. 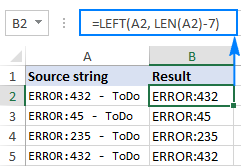 I have a lookup reference to an =left output, but it keeps showing an error. But if I type the actual text, the data populates correctly. There are no spaces or anything like that. I tried to convert to a number... Still no. Is there something about the text output that would cause a problem using it as a lookup value? I have tried PROPER and LEN functions but not able to achieve it? Any suggestions please?